We caters to trans shipping by Bonded trucking services cargo to requirements of our clients. We commenced its bonded trucking services in February 2002 and has since moved up to become the premier bonded trucking services provider in India. We offer a 24 X 7 service to meet customers' requirements. Bonded trucking is a relatively new concept in India and Shreeji has been a pioneer in this field. Shreeji's foray into Custom Bonded Trucking in 2002 has been a path breaking move and well received by the Airlines Industry. Transportation of Air & Sea Cargo, Customs cleared in hinterland to International Airport and all ICD Port for SEZ cargo's. We have achieved the tag of being one of the reputed services providers with years of experience in cargo carriers. We offer bonded trucking services to our clients. We are eligible to deliver single or bulk consignments to the clients premise within the time frame and within the budget provided by our clients. We ensure safety during the transit period as client satisfaction is our mission. Thakur Shipping Agency is the leader in the provision of scheduled bonded trucking services within the nation. Our services are customised to meet your specific requirements and guarantee time sensitive over-night deliveries. 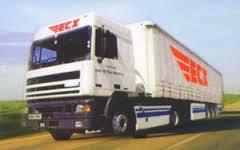 Bonded trucking is a relatively new concept in India and IOCC Shipping has been a pioneer in this field. IOCC Shipping's foray into Custom Bonded Trucking in 2001 has been a path breaking move and well received by the Airlines Industry. Cactus International is the leader in the provision of scheduled bonded trucking services within the nation. Our services are customized to meet your specific requirements and guarantee time sensitive over-night deliveries. Our organization is indulged in providing Bonded Trucking Service to our clients. We offer trans shipping by Bonded trucking services cargo to requirements of our clients. We had moved up to become the premier bonded trucking services provider. We offer transportation of general/heavy cargo to/from all inland destination in india.The service if offered round the clock . As per the needs of customer we arrange transportation of all types which includes trailers/ bonded trucks/consolidation trucks. M/s Shreeji Transport Services (P.) Ltd.
We have a vast network of distributors enhancing our efficiency and customer service. 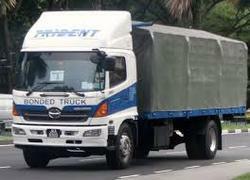 Our fleet of trucks is modern and meets all the Regional Transport Organisation's criteria. With the best in class fleet of trucks we provide end-to-end solutions to our customers. With the help of inter modal transportation we delivery the consignment at the right place and that too at a right time. Bonded Cargo is cargo that is under the bond of customs either due to the fact that inbound cargo has not yet been cleared or that outbound cargo has already been cleared. The transportation of such cargo must be only by closed trucks which can be sealed by customs. This requires special locking facilities which are available with ICSA.